Directory listings are essential to your customers, but they also represent a large expense for you. Directory Listings Audit services from Neustar Professional Services improve the accuracy of your listings for a better customer experience and prevent you from paying listing fees for telephone numbers no longer active in your network. Our ordering, fulfillment and directory listing experts can identify potential customer issues created by data errors and omissions. The audit also provides an accurate accounting of the telephone numbers active in your network to verify numbers for which you should be billed, as well as cases where you are being over-billed for numbers no longer in service. Out-of-synch directory listings could be costing you tens of thousands of dollars, or more, each month. Directory Listings Audits improve the accuracy of your listings, which provides a better experience for your customers, especially business and commercial customers who heavily rely on directory listings. Identifying inaccuracies minimizes costly customer impacting errors and improves your overall bottom line. Directory Listings Audit: identify listing discrepancies before they become customer issues. Directory Listings Billing Audit: identify discrepancies between ILEC directory listing invoicing, your number ownership and Carrier Access Billing System (CABS) records. Resolution and Maintenance Services: when the magnitude of discrepancy has been determined, Neustar provides a proposal to resolve identified discrepancies, along with recommendations for long-term resolution. Neustar can assist you with performing an internal data audit/reconciliation effort by providing you industry telephone number data, including SPID and LRN, so you can identify telephone number ownership and routing. Neustar will audit your directory listing repository against multiple systems (OSS, billing records, LEC DL invoices/CABS billing records) to analyze and identify out-of-synch conditions. For each identified out-of-synch scenario, Neustar will provide recommendations for corrective actions during order management and processing (for example LSR submissions for DL disconnect or adding DL to billing records). Neustar also provides a prioritization summary that recommends the priority for taking corrective action. 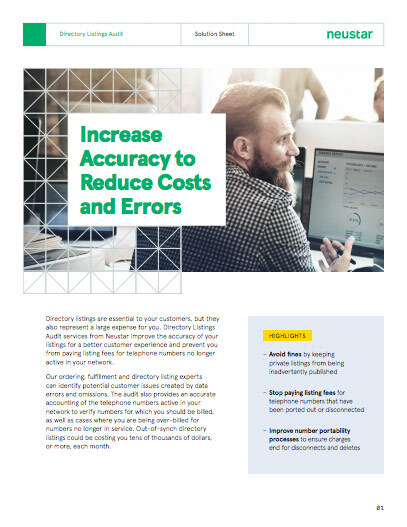 Maintain the accuracy of directory listing billing with process changes that increase the accuracy of listings and the efficiency of your ordering processes. Our subject matter experts work with your team to identify the root causes of problems, identify gaps and recommend process improvements.